Almost the same number of Christian (37,521) as Muslim refugees were admitted in fiscal 2016, which ended Sept. 30. 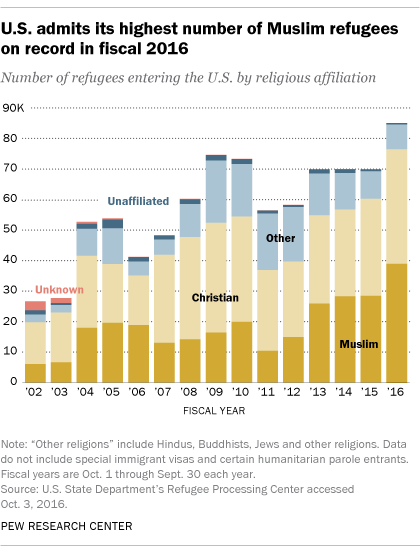 A slightly lower share of 2016’s refugees were Christian (44%) than Muslim, the first time that has happened since fiscal 2006, when a large number of Somali refugees entered the U.S. Overall, a far larger total number of Christian refugees than Muslim refugees have entered the U.S. since fiscal 2002. During the past 15 years, the U.S. has admitted 399,677 Christian refugees and 279,339 Muslim refugees, meaning that 46% of all refugees who have entered the U.S. during this time have been Christian while 32% have been Muslim. In the just-ended fiscal year, about 8,120 refugees (10%) were members of faiths other than Islam or Christianity. More than 3,000 belonged to Buddhist traditions while nearly 2,000 more were Hindu. A much lower number of refugees in 2016 were atheists or claimed no religious affiliation (449 refugees overall, or less than 1% of the year’s refugees). The U.S. received 84,995 refugees in fiscal year 2016, effectively meeting the 85,000 ceiling set by the Obama administration at the beginning of the year. 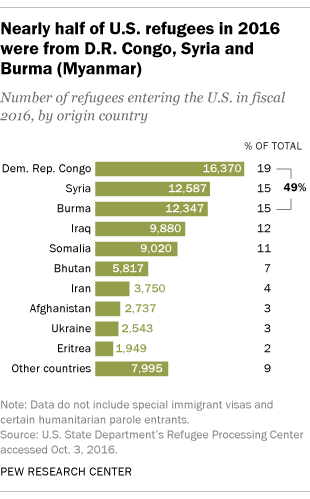 The Democratic Republic of the Congo (16,370), Syria (12,587) and Burma (Myanmar) (12,347) were the top origin countries of refugees in 2016. Together, refugees from these three nations represented nearly half (49%) of all refugees admitted to the U.S. over the past year. The administration set the goal of resettling 10,000 Syrian refugees in the U.S. in the fiscal year. This goal was exceeded, and refugee status was given to 12,587 Syrians. Nearly all of them (99%) were Muslim and less than 1% were Christian. As a point of comparison, Pew Research Center estimated Syria’s religious composition to be 93% Muslim and 5% Christian in 2010. Note: This post, originally published Aug. 16, 2016, has been updated to include data for all of fiscal year 2016.